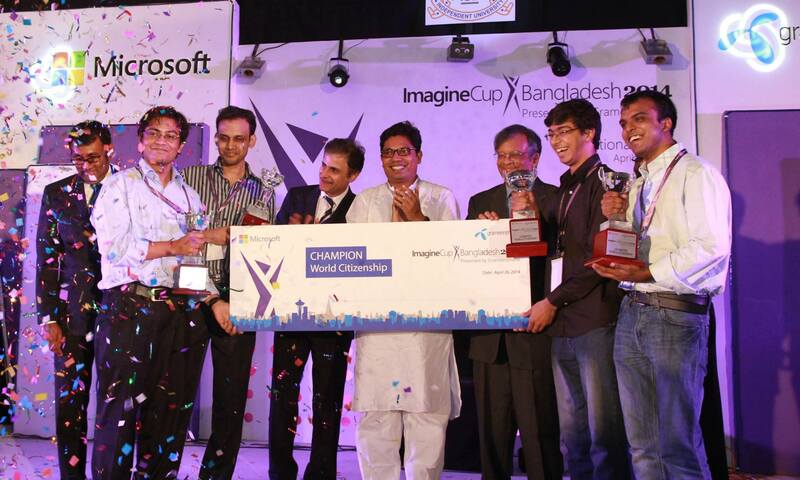 A team from BUET won the Championship in World Citizenship category of the Microsoft Imagine Cup 2014 Bangladesh round. The team, named ‘The Imaginarium’, comprised of four students of Level 3 Term 2. The team members are Taslim Arefin Khan (CSE), Mainuddin Ahmad Jonas (CSE), Hasanur Rashid (ME) and Mushfequr Rahman (EEE). The team mentor is Mohammad Saifur Rahman, Lecturer, Department of CSE. This win allows the team to qualify for the online semi-finals to be played among the local champion teams of Asia Pacific region. If successful in the semi-final, the team will be promoted to the World Finals, to be held at the home of Microsoft- Seattle, USA. Last year ‘BUET 101’ won the championship in the same category with their project ‘Happy Watch’ and attended the World Finals at Russia. According to Microsoft Bangladesh, a total of 250 teams from both private and public universities submitted their project proposal. Based on the proposals, 42 teams were selected for the preliminary round. The preliminary round was held at the Microsoft Bangladesh office on April 11 and 12. A total of 9 teams got selected for the final event on April 26. 3 teams were selected for each category. The categories were World Citizenship, Games and Innovation. The BUET team was the only team from any public university in the local final round. The Imaginarium conceived and demonstrated the project ‘Sign of Life’. Motivated by the tragic industrial accidents in Bangladesh, especially the Rana Plaza tragedy, the project extensively applies information technology in the end-to-end work flow of a post-disaster search and rescue operation. It includes modules to detect sign of life, overlay the location of trapped survivors on a detailed factory floor map to guide the rescue workers and real time alerts to next to kin when a survivor is rescued. As part of readiness for post disaster recovery, each factory worker will be given a wrist band. The factory floors will be equipped with custom routers, which are able to communicate with the wrist bands. Both these devices will be shielded to make them fire proof and durable. As a First Responder Unit, the Fire Service and Civil Defense will be given a Windows 8 application. At the backend, the extensive data management is done by Windows Azure. In times of a disaster, the Fire Service team can conduct an informed search and rescue mission. They will be able to locate survivors based on the signals between each wrist band and router. Additionally, this application will provide the fire service men a detailed floor map of the factory. Emphasis has been given on the post-disaster preparedness and readiness.